There’s used to be a time where i could just take out my phone, snap some photo and plug some cable and have iPhoto to automatically imports those photos i’ve taken previously. But that changed when i switched to Android late last year and getting more intimately with it everyday. The nature of open source and once you reached at the stable point, make it really hard to go back to using the iPhone. Especially given by the factor i dislike the iOS7’s flat design and lacked of tactile feedbacks to improve it. Having iTunes and iPhoto to manage my music and pictures make it really easy to keep my devices in sync without having to do it myself. Nevertheless, i’ll figure out what to do about it as time roll on. The time has rolled. Let’s talk. Syncing with cloud is what Google’s does best, and syncing locally with your computer unfortunately is what Apple’s been doing best. And i’d prefer to sync locally rather than put everything on cloud and have NSA to take a peek. I didn’t rely much on cloud services but my life do evolves around Google with Gmail, Calendar, and Maps that i’d use throughout the day. I don’t want to use Picasa to manage my photo, all i want is something simple like 1) take a photo 2) without having to plug in cable, i’d just use the wifi for transfer. 3) And i don’t have to switches on my pc to sync. With all due respect, its look like i’m gonna need to consider using cloud service again, like Dropbox. 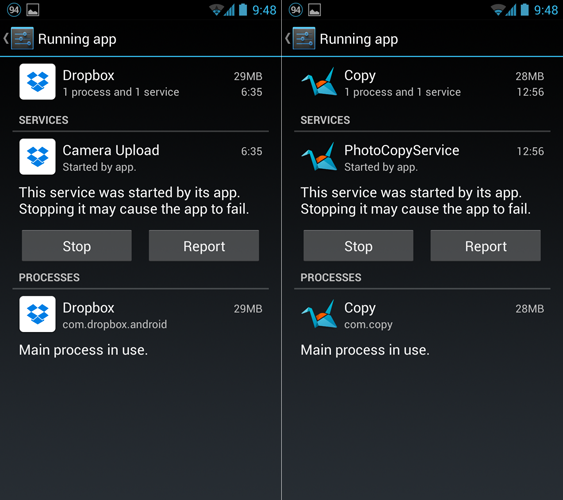 But this time, its Dropbox vs Copy, a newcomer. So what’s the different between these app? Well, aside from easy syncing function you could imagine, minus with privacy issue one of them might look into your data and some other stuff that you don’t really need to worry about, there is zero issue i could think of. They both works great, have beautiful UIs and generously with giving their user ample of storage that’s sufficient for mobile use with options to expand it for free. 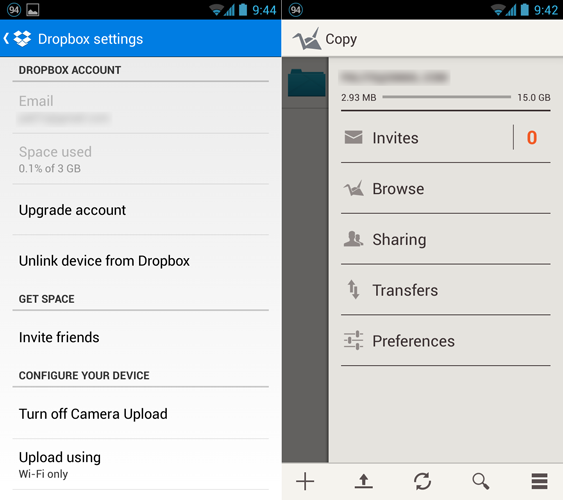 You’ll get 2GB when you signed up for Dropbox and 15GB(!) when you signed up for Copy. 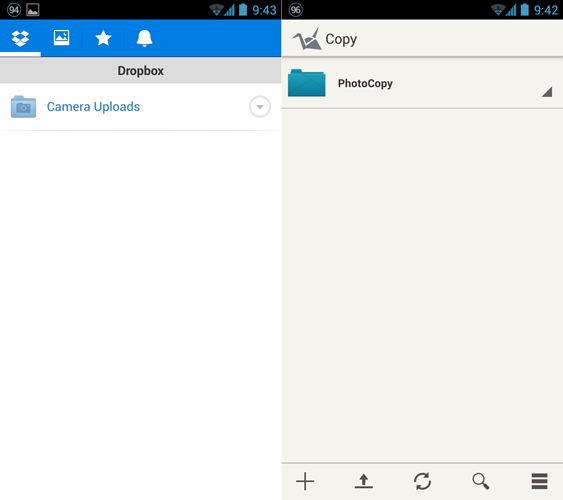 Dropbox and Copy interface. Notice the similariy. Once you installed and logged in, both apps will ask you if you’d like to turn on automatic camera sync function. If you don’t, you can skip it and have it set up later. Then it will take you to main screen where you can, well, doing your stuff. If you have some documents that you might want to throw in and having it sync as well, you can with these app. However for me, i use solely for photo syncing. Standard 4-pin security for gf/bf checking-proof. 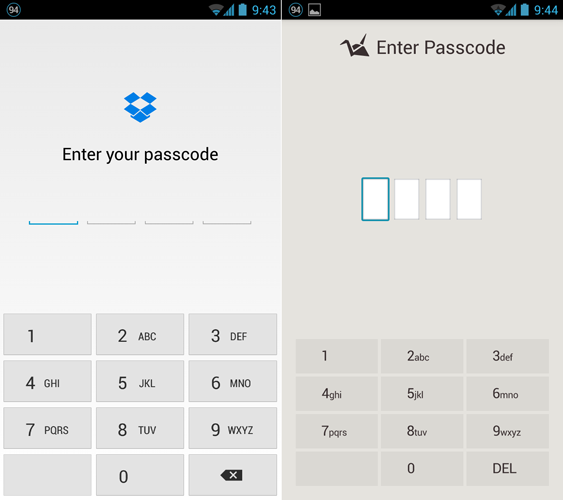 As these apps will deal with your data, you can setup 4 pin lockcode that you have to enter everytime you want to use it. This to prevent from anyone that might want to take a peek at your photos that you’re already deleted from your devices but still available on cloud. Personally in here, i like the Dropbox’s UI better. As i mentioned earlier where you can setup automatic camera sync later, tapping menu button on Dropbox will give you few list to go to the settings. On Copy, it will give you more features that will slide out from right screen and offer more preferences to play with compare to Dropbox. I conclude Copy would like to target wider range of users giving by their amount of storage, contrast with Dropbox which is focus as camera sync function. System usage. Both are respectably identical. 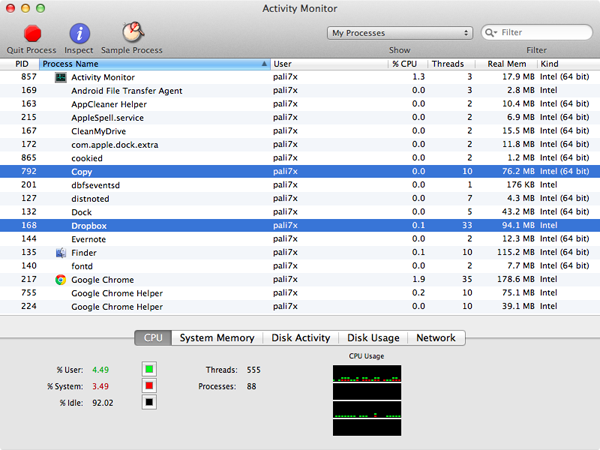 Since these apps are going to run in background, i need to keep an eye on system usage. I’m pleased to report both of them didn’t use as much resources available, which gonna drag the system down and eat up valuable battery life. So, for the conclusion. Which one would i recommend? I’ll list down both of their advantages and you’ll have to decide on your own. + Much better and cleaner interface. + Upload screenshots as well. + Don’t bother you with any notification. + 15GB sign up storage with unlimited free expandability. + Only upload photos that you’ve taken. + Will notify you with every uploads and downloads. Personally for me, i’ve decided to stay with Dropbox. It has clean UI, won’t bother me with notifications, i could just take photo and it’s already on my computer. Or i could just forget about it. Sure it comes with way less space than Copy, but as photo syncing function, that’s all i ever need for now. I shoot in 8MP or 6MP wide, and i’d delete it from my phone after it’s done with syncing and move it over from Dropbox’s folder to iPhoto so i can reclaim those valuable space back. Last but not least, it do work as temporary backup too. So now, it leaves to your personal taste which one would you like to use as your cloud service. Pick one, and ride it hard. Bonus : Dropbox and Copy’s systems usage for Mac. Note that Copy runs in 64bit mode with even less memory usage! I hope this post will help you as much as i do. So which one you’re going to use? If you have better option than this, hit me an email.